I don't know why maven is refering to jre, when my environmental variable is jdk. I also changes installed JRE to jdk1.6. It has 4 steps TODO. Had the same problem, but in my case, the directory eclipse pointed the JRE was the JDK. So, i searched for that tools.jar and was there. It sounds like you have JDK_HOME defined as a user variable and PATH defined as a System variable, or vice versa - echo %PATH% should not contain unresolved variables like ...;%JDK_HOME%. Make sure that the %JDK_HOME%\bin path is on your PATH variable, unresolved, even if you have to put the path in explicitly. I had the same Error, because of JUNIT version, I had 3 3.8.1 and I have changed to 4.8.1. In Eclipse, actions like importing Maven projects or invoking "Update Sources" runs in the same JVM in which Eclipse is running. If that JVM comes from JRE that isn’t part of JDK, there would be no Java compiler (the tools.jar). I have encountered a similar problem, and as no one posted an approach similar to mine, here I go. Navigate to the run configuration you wanted to launch. There chose the JRE tab. Adjust the "Runtime JRE" there, and you're ready to go. 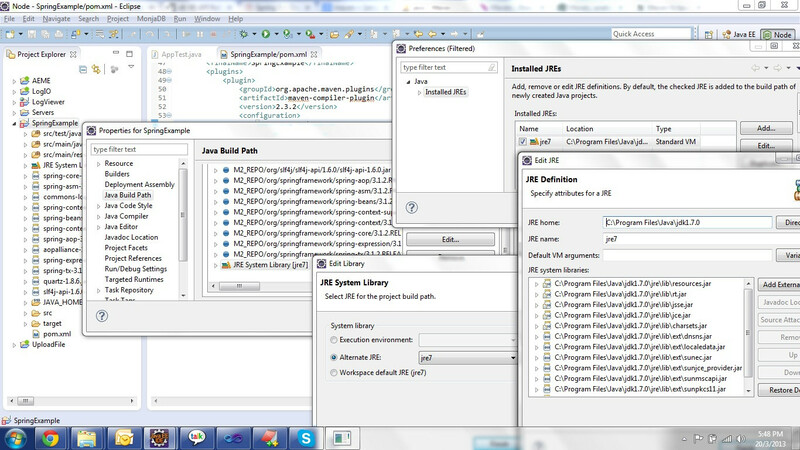 Right click on project select Build path -> Configure build path -> select Libraries Tab -> then select JRE System Library[version you have for me its JavaSE-1.7] - > click Edit button -> In JRE System Library window select Execution environment - In drop down you can select the JDK listed for me its JavaSE-1.7 -> next to this click to Environments button -> In Execution Environments window you have to again select your java SE for me its JavaSE-1.7 -> just select it, you will have options in Compatible JREs tab, so select JDK that you want to have in my case its jdk1.7.0_25. Click ok and finish the rest windows by doing appropriate action Ok/Finish. Lastly do Maven Clean and Maven Install. It depends on of Maven version. When you will install newer version of Maven, this error would not appear. You may also add another directory with tools.jar file lib/tools.jar - it also solve this problem. If you we are doing all above steps that may be confused and our problem is just missing tools.jre so just add tools.jre by the following steps and problem is solved. now apply changes and it works fine. Notice the \jre at the end - a surprising necessity. I tried all of the above suggestions, which did not work for me, but I found how to fix the error in my case. 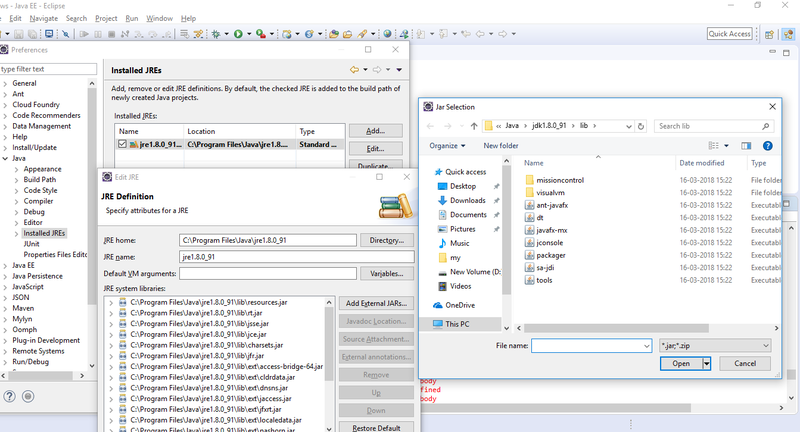 In project explorer, right-click on project, select “properties” In the tree on the right, go to Java build path. Select the tab “libraries”. Click “Add library”. Select JRE system library. Click next. Select radio button Alternate JRE. Click “installed JRE’s”. Select the JRE with the right version. Click Appy and close. In the next screen, click finish. In the properties window, click Apply and close. In the project explorer, right-click your pom.xml and select run as > maven build In the goal textbox, write “install”. Click Run. This made the project build succesfully in my case. and dont forget to restart Idea. This program picks up variables at start so any changes to environtment variables while the program is running will not have any effect. Not the answer you're looking for? Browse other questions tagged java maven javac or ask your own question.